Vyvanse is a commonly prescribed medication that has made a significant difference in the lives of thousands of adults and children. Patients who are taking this medication should be informed of all of the possible side effects of Vyvanse, including heart palpitations or pounding and hallucinations. Though none of these side effects are immediately life-threatening, they should be reported to a physician if they persist for a long period of time, become bothersome, or present any sort of risk to the patient. Most of these side effects will diminish on their own over time. Failure to seek immediate medical care while experiencing any of these serious Vyvanse side effects may result in irreversible bodily harm or even death. Patients with any of these symptoms should go to the nearest emergency room or dial 911 for help. Children who experience any of these side effects should be closely monitored by their physicians in the event that the dosage of Vyvanse would need to be altered or the drug would need to be stopped altogether. Children who experience allergic reactions or heart palpitations should see a physician immediately. Who Should Not Use Vyvanse? Although Vyvanse has been shown to be effective at treating ADHD, it should not be used by certain people. Anyone with chronic high blood pressure, congenital heart defects, heart disease, thyroid disease, arteriosclerosis, glaucoma, severe anxiety or a history of drug abuse should not use Vyvanse. Patients with a personal or family history of mental illness including bipolar disorder, suicidal tendencies, depression or other psychotic disorders should only use Vyvanse under the close supervision of a psychiatrist and a physician. Caregivers should be alert and aware of any Vyvanse side effects that may present themselves at any time during treatment. 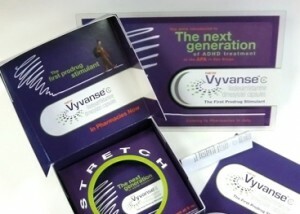 Vyvanse should be taken exactly as prescribed, usually only once daily in the morning. The capsule should be swallowed whole and never chewed or crushed, but patients who experience difficulty swallowing the capsule can sprinkle the contents into a glass of water and drink it immediately. The medicine should be stored at room temperature and away from light, heat and moisture. Patients will need to see their physicians and psychiatrists regularly during treatment in order to be monitored for the side effects of Vyvanse. This medication carries a serious risk for abuse; improper use can cause serious health issues including permanent damage to the heart and sudden death in extreme cases. Patients who are taking Vyvanse should be aware of the symptoms of overdose. In many cases, patients do not need to consume large amounts of the drug in order to experience an overdose. The signs include restlessness, tremors, confusion, lethargy, fever, flu symptoms and dark colored urine. These symptoms may eventually dissipate and be replaced by depression and extreme fatigue, but this does not mean there is no danger to the patient. If overdose is suspected, patients and caregivers should seek immediate medical care in order to prevent permanent damage to the heart or death. Vyvanse is a commonly prescribed medication that greatly improves the lives of children and adults who suffer from ADHD. While the medication is highly effective, it can certainly be dangerous and carries with it a host of side effects.